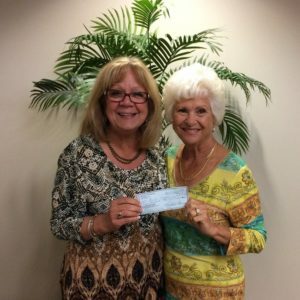 Barbara Garney presents Be An Angel a donation for hurricane relief. As you all know, the entire Houston area was hit hard by Hurricane Harvey. Our hearts go out to all of our shooters and the ranges we love as everyone is recovering from the storm. Unfortunately, Clay Mound Sporting Center and the Lady Clay Shooters had to make the decision to cancel the next stop on the Tour de Clays that was scheduled for September 16th. Not only did Clay Mounds lose a lot of equipment in the flooding, but the roads were destroyed in the process. We have followed Clay Mound’s progress as it continues to clean up and rebuild after the storm. It is our hopes to reschedule next year and give you the opportunity to shoot at Clay Mound. 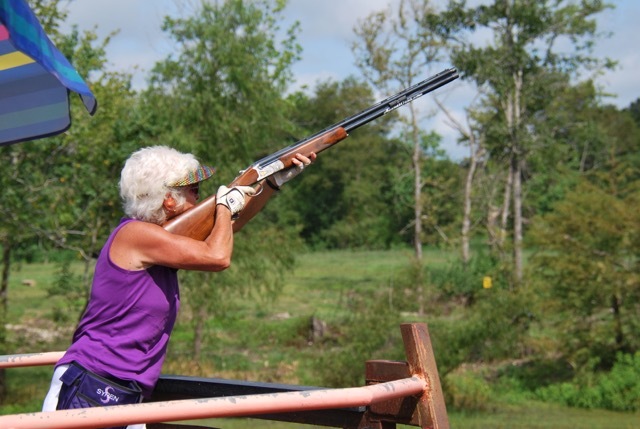 In true typical spirit of both Houstonians and the ladies who shoot with Lady Clay Shooters, many of our ladies who had registered prior to Hurricane Harvey for the Tour de Clays at Clay Mound Sporting Center donated their registration fees to Be An Angel. Barbara Garney presented Marti Boone, the Executive Director of Be An Angel, a check for $910.oo. Be An Angel will use this money to replace hearing aides and other equipment lost during the flooding. An occasional alligator critiques your shooting. Just so you have something to look forward to, we wanted you to know that Clay Mound is located in Liberty, Texas just off Highway 90. You will find great target presentations; with the opportunity to shoot out over water. If you look closely, you might even find an alligator sunning itself or peeking out of the water to see how well you are shooting. The course is easily walkable. You will have time to visit with your squadmates as you move from station to station. After shooting, we will make plans for lunch. Here we will have a time to mingle, catch up with each other, and get to know new friends. 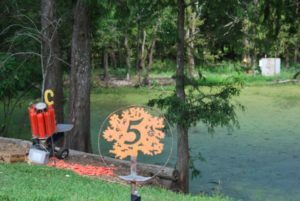 The Tour de Clays is designed to introduce our ladies to new courses and give them the opportunity to experience what the Houston area has to offer! As we make our way around the ranges, the Tour de Clays is also about camaraderie. This will be your opportunity to see new ranges, meet new friends, and hang out with fellow lady shooters. Because the Tour is all about you and your shooting experience, we do not keep running scores or give out prizes. We welcome you to join us! You will be delightfully surprised by what Houston has to offer, and we are pretty sure you will go home with a new shooting buddy and friend! Look for details when we are up and running again.